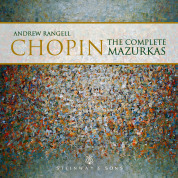 This is the first set of mazurkas Chopin wrote in Paris, and it came at a time when the composer was a struggling artist attempting to make a name for himself in the French capital, not as a Polish émigré but as a Polish exile who fully intended to return to his homeland when the political situation changed. It did not in his lifetime, and he never saw Poland again. The first of the mazurkas in this set, No. 10 in B flat major, features an attractive robust theme that has an aristocratic air about it -- or at least an air that calls to mind the more fashionable ballrooms of nineteenth-century Poland. The middle section is subdued in its grace and mystery, and very brief. The main theme returns and is presented in much the same way it was previously heard. By the end of this three-minute piece, its repetitions can weary the ear a bit. No. 11, in E minor, is marked Lento, ma non troppo, and opens with a typically ambivalent Chopin theme: it has a certain brightness and Slavic pride, but its overall manner is reflective and gloomy. The common view of Chopin in France was that here was a composer struck by homesickness, if not culture shock. Anyone needing evidence of his melancholic frame of mind need look no further than this and the next two mazurkas. A typical performance of the E minor Eleventh lasts about two-and-a-half minutes. The next one in the set, No. 12 in A flat major, marked Legato assai is, along with No. 35, in C minor, and No. 50, in A minor, one of the longest mazurkas Chopin wrote, lasting about six minutes in a typical performance. The main theme is lovely, but beset by a tendency to mire itself in its own suffocating beauty. The music aspires to brightness, it seems, but can only manage a grayish haze. The middle section offers sunnier prospects, but in the end does not deliver on its promise. The main theme returns and the music ends in a gentle, almost despairing mood. The last mazurka here, No. 13 in A minor, marked Lento, ma non troppo, is one of the composer's most touching creations. If the previous mazurka is dark and sad, this one is utterly despondent. It has beauty and moments of brightness, to be sure, but the main theme wallows in hopeless descent, wallows in bleakness. This is typical Chopin, though: his music so often seems to say life is sad and pathetic, but filled with beauty and vague hope. The middle section offers that dubious hope, but does not lead the music from the doldrums. The melancholic main theme returns and the close is beautiful but bleak, the listener held captive by Chopin's thematic and harmonic resourcefulness. This piece lasts about four or five minutes in a typical performance.